Not the healthiest of topics - especially during the time of year when many are focusing on resolutions of health and wellness. I apologize. I grew up with grandmothers who always saved the grease after frying up bacon. It was like, liquid gold to them. They used it to flavor green beans later in the week or as the base for country gravy. My Kentucky-raised granny would buy bacon sometimes just for the purpose of using the leftover drippings that week for a specific dish. So, when I was working recently on a scalloped potatoes and ham recipe using leftover Christmas ham, I had this insanely crazy idea to toss in a few dollops of our solidified bacon grease. The idea wasn't so crazy to me at the time - I always top my scalloped potatoes with some pats of real butter. Butter is fat. Bacon grease is fat. But, bacon grease equals tons of flavor. It all made perfect sense. The result was the tastiest scalloped potatoes I've ever had. I've tested the recipe twice since then and I have simply come to adore it. The bacon grease not only imparts flavor, but it creates almost a velvety texture when it comes to the "mouth-feel" of the sauce. Obviously, this isn't "diet food." Besides testing for the blog's sake, this isn't something I'd make repeatedly in a short period of time. But, the next time you're craving classic scalloped potatoes and ham or needing something to take to a potluck, I urge you to give this recipe a whirl. This makes enough to feed an army. If you're not serving an army, that's okay. In my household of five, we make sure we have leftovers of this. The leftovers may even be better actually. Just spoon some into a large coffee mug or ceramic bowl the next day, splash in a little milk and heat until bubbly in the microwave. There is nothing better. I pinky swear! Preheat oven to 350 degrees. Grease a large casserole dish - mine was a 4-quart ceramic roasting dish. Set aside. Place all of the sliced potatoes and chopped ham in a large mixing bowl. Sprinkle on 3/4 - 1 cup of flour (enough to coat potatoes thoroughly). Add in the salt and pepper. Pour potato mixture in the prepared baking dish. Add in the milk - use enough to come 3/4+ of the way up the sides of the dish. Gently stir a bit. Top with pats of batter and dollops of bacon fat. Lid, if possible. Otherwise, cover tightly with foil. Bake for around 3 hours. (Baking time can vary depending on the thickness of your baking dish and how spread out your potatoes are.) I stir my potatoes a couple of times during baking - just to ensure that the butter and bacon fat blend into everything. (I, also, taste partway through baking to see if I need to add any additional salt or pepper.) Towards the end (and once you know your potatoes are tender), you can remove the lid/foil if things need to thicken and brown up a bit. Alternately, you can add in a few splashes of milk along the way if you think things become too dry. Remove from oven and allow to rest a few minutes prior to serving. How do you store your "saved" bacon drippings? Do they need filtering or refrigeration? 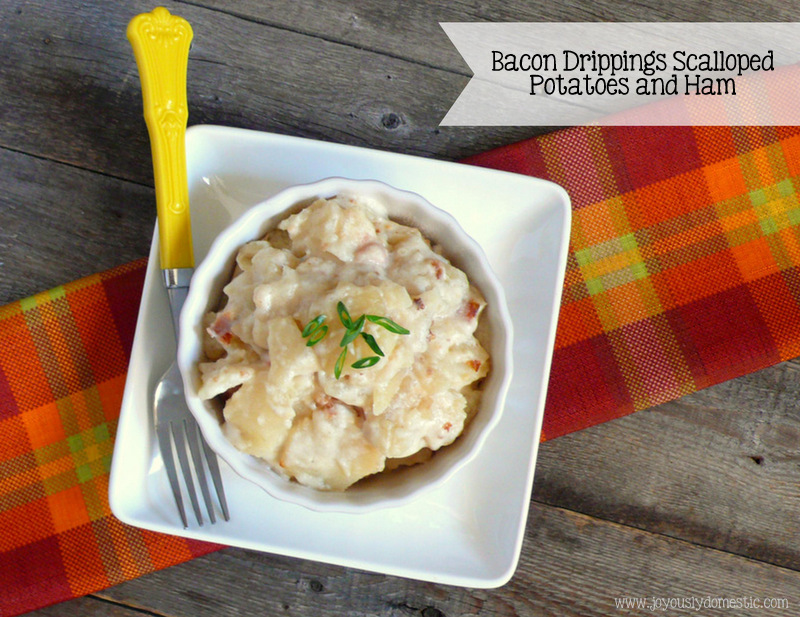 This may be a stupid question but just wanted to know as I have seen other recipes use saved bacon drippings. Thank you! You can strain it if you'd like - it's kind of a preference thing. You can use cheesecloth, a fine mesh strainer or some people use paper towel. I keep mine in a mason jar with a tight lid in the fridge. You know, you can just buy the bacon grease. I just bought some about 3 weeks ago. I cook with it a lot, and don't eat enough bacon to have a good supply of it.